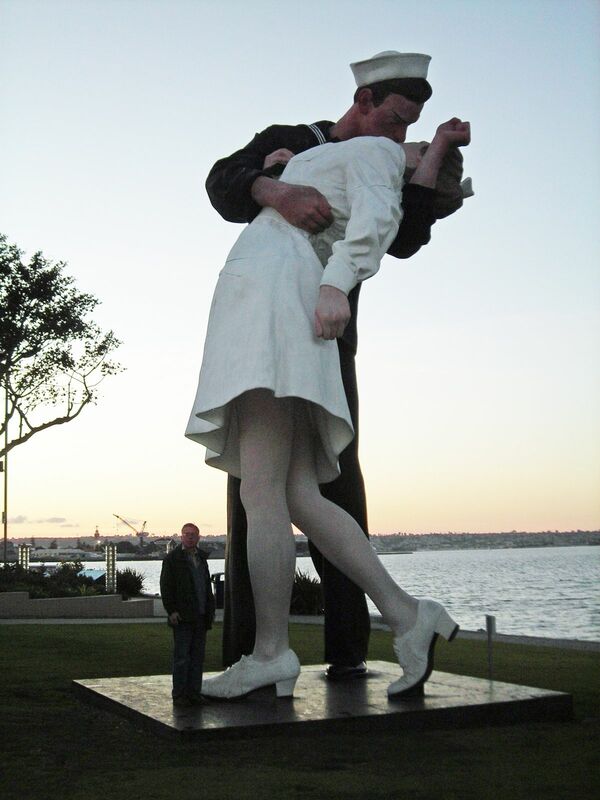 San Diego Kiss – The Home of My "Big Things"
With the whole family together we decided to spend the day in San Diego. Annie and Ben, Julia and Deb went to the zoo. Andy and I went to the Midway aircraft carrier docked in the harbor. What an interesting experience. The Midway has quite a history. If you are in San Diego be sure to visit. Many of our young people spent time on this vessel. At the end of the tour Andy and I were looking South to a city park and noticed this very large sailor locked in an embrace. I don’t know if he was leaving on a tour or coming back, but he seemed glad to see her. The image is not great since it was taken at dusk, you get the idea nonetheless.